Wow! Even the best Riding Mower will need a tune up eventually. Want to DIY and save money? We can help, with step by step instructions presented on DVD and CD. A great product, especially for the beginner! Free bonus book included! Sears is a great place to buy a mower, for several reasons. Good selection, convenience, and well built brands are but a few of the reasons to go with Sears.. Very few manufactures offer a real riding lawnmower these days ( see the explanation of how a riding lawnmower differs from lawn tractors and ZTR mowers). Sears and Snapper are about the only places to buy a new riding lawnmower these days. 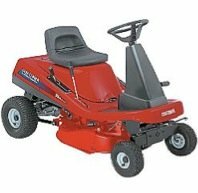 Since Sears does not manufacture the Craftsman brand, it only follows that the Sears riding Lawnmower must be made by Snapper. Sears offer one riding lawnmower model. It represents the best model made by Snapper, with a surprisingly low price. Sears has the lone riding lawnmower in the section of the website dedicated to lawn tractors. The machine is identified asRER Lawn Tractor(presumably standing for ‘Rear Engine Rider’). Let’s forget for the moment this is not a lawn tractor at all - it is really a riding lawnmower! Semantics aside, this is a sweet machine. It features the ‘3 in 1’ option,allowing for side discharge, mulch, or rear bagging. Mulching and rear bag collectors are offered as options at an additional cost. The deck cutting height is adjusted manually using a lever. The chassis has a pivoting design, and is fabricated of solid steel. The deck feature the ‘step through’ design. This eliminates any obstructions in front of the drivers seat. This allows for easy entry and exit from the tractor without the need to lift feet and legs over a raised portion of the frame. In addition, since the engine is mounted in the rear, there is much better visibility in the front of the riding lawnmower when it comes to steering and avoiding obstacles. The RER Lawn Tractor is powered by a 13.5HP Briggs and Stratton engine, with a pressurized oil system (no oil filter) and electric starter. The transmission is the hydrostatic gear variety, and is controlled by a one foot pedal. Disc brakes help slow this baby down when needed. A single blade cutting deck leaves a 30” cutting swath. The deck is floating, to help prevent scalping on uneven lawns. Side discharge comes standard, with options to convert into a mulching mower, or rear bagger. One of the best reasons for buying a Sears riding lawnmower is the cost. Sears recently advertised this riding lawnmower for about $1400.00, which is a substantial savings compared to purchasing the same mower from Snapper. Bottom line? If you want to buy a riding lawnmower, this model represents the best combination of features and price you will find anywhere.